Have you ever jumped right into a comic, book, or film with absolutely no background on the material, and quickly found yourself wondering what the hell is going on? And it’s only after you have read the official synopsis that the mists of confusion suddenly begin to dissipate? Yeah, that just happened. With the benefit of hindsight, it has become clear that the titular Neverboy is an imaginary friend, one who has crossed the boundary from the fantasy world where he belongs and discovered a way to exist in the real world. His presence in this dimension has its limitations, though. He is only able to interact with certain people; a delusional hypochondriac, a little girl playing doctor, and a man in a drug-induced coma, for example. 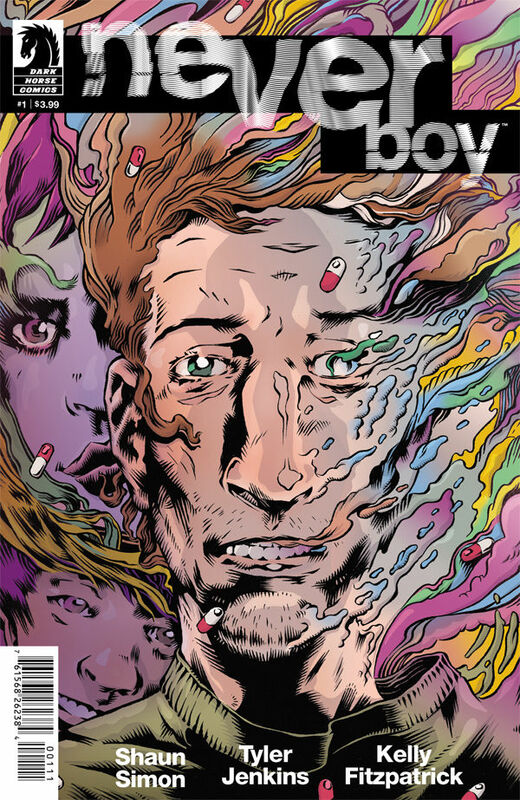 Indeed, drugs play a central role, not only with regard to the surrealist cover art, but in the overall narrative, as staying ‘medicated’ is how Neverboy continues to exist in the physical realm. Should the meds wear off, he becomes susceptible to arrest by agents from the fantasy dimension (a group of men who lurk on the periphery of the story), under charges of unlawful existence and illegal use of fantasy. It also drains the colour from the character and the things he’s created, as if sucking the very life from his fantasy. Shaun Simon’s fascinating, if at times opaque story, is essentially about the desire to be seen, to be relevant in someone’s life, and as such has real emotional heft to it. As the story progresses we are told the story of Sam, a kid Neverboy befriended in the past. This section is characterised by the use of a lively technicolor palette by Kelly Fitzpatrick, and I felt it served to neatly differentiate how children see the world as compared to adults. Tyler Jenkin’s art is a perfect fit for the story, the sketchy elongated protagonist appears ill-at-ease in the confines of the panels, as though aware of the unstable nature of his reality. Also of note is a clever metaphor for how easily someone’s world can be crushed, and how it is used to highlight the resolve children show in face of adversity when given a strong enough shoulder to lean on, be it real or imaginary. At first seemingly impenetrable (at least to me, anyway), Neverboy turned out to be a pretty rewarding experience, one worthy of your patience and your coin.